Publication History: This article is based on "Crain's Unconventional Reservoirs" by E. R. Crain, P.Eng., 2006. Updated annually through 2016. Updated Mar 2019. This webpage version is the copyrighted intellectual property of the author. Organic carbon in the form of kerogen is the remnant of ancient life preserved in sedimentary rocks, after degradation by bacterial and chemical processes, and further modified by temperature, pressure, and time. The latter step, called thermal maturation, is a function of burial history (depth) and proximity to heat sources. Maturation provides the chemical reactions needed to give us gas, oil, bitumen, pyrobitumen, and graphite (pure carbon) that we find while drilling wells for petroleum. Organic carbon is usually associated with shales or silty shales, but may be present in relatively clean siltstone, sandstone, and carbonate rocks. A source rock is a fine grained sediment rich in organic matter that could generate crude oil or natural gas after thermal alteration of kerogen in the Earth's crust. The oil or gas could then migrate from the source rock to more porous and permeable sediments, where ultimately the oil or gas could accumulate to make a commercial oil or gas reservoir. If a source rock has not been exposed to temperatures of about 100 °C, it is termed a potential source rock. If generation and expulsion of oil or gas have occurred, it is termed an actual source rock. The terms immature and mature are commonly used to describe source rocks and also the current state of the kerogen contained in the rock. Total organic carbon (TOC) as measured by laboratory techniques historically has been used to assess the quality of source rocks, but now is widely used to help evaluate some unconventional reservoirs (reservoirs that are both source and productive). Pathways that convert living organisms to organic carbon, from "Bitumens, Asphalts, and Tar Sands" by George V. Chilingar, Teh Fu Yen, 1978. In the lab, it is relatively easy to distinguish kerogen from hydrocarbons: kerogen is insoluble in organic solvents, oil and bitumen are soluble. Pyrobitumen is not soluble but its hardness is used to identify it from kerogen. 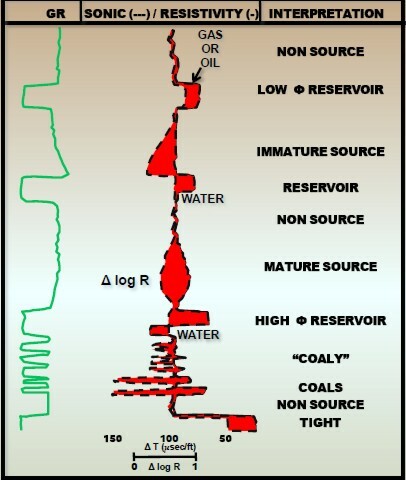 Graphite is evident on resistivity logs because of the very low resistivity; all other forms of organic carbon are resistive. Organic carbon has a density near that of water, so it looks like fsporosity to conventional porosity logs. 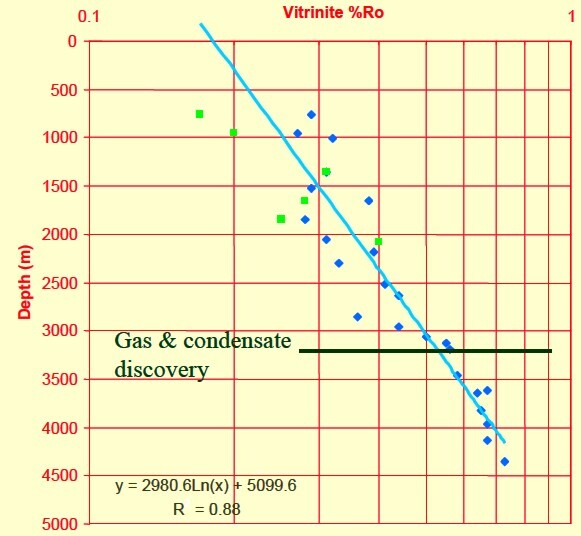 High resistivity with some apparent porosity on a log analysis is a good indicator of organic carbon content OR ordinary hydrocarbons OR both. Some more definitions are in order. All hydrocarbons are composed of organic matter (OM), posibly with inorganic impurities. Kerogen and coal are called primary organic matter as they were deposited during sedimentation. Gas, oil, bitumen, and pyrobitumen are called seccondary organic matter as they were formed in place in a source rock and may have migraated from there to another reserervoir rock. Kerogen has been associated historically with source rocks but has gained more notice recently as the source of hydrocarbons in so-called gas shale and oil shale (unconventional) reservoirs. Kerogen is the source of oil or gas in the free porosity and can also hold producible gas within its structure in the form of adsorbed gas. Some reservoirs that have been treated or described as gas shale or oil shale have little or no kerogen (tight gas or tight oil reservoirs). Some of tight gas plays may have bitumen or pyrobitumen, instead of kerogen. Pyrobitumen can hold adsorbed gas in nano- or micro-porosity, similar to kerogen. For example, where the generated hydrocarbons have largely remained within the source rock, as in the Barnett Shale, the organic matter will be a mixture of kerogen and pyrobitumen. 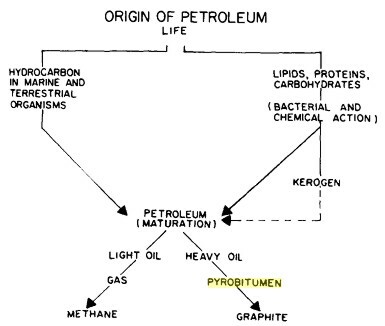 However in other tight gas plays (Montney, Marcellus), petrographic analysis indicates that pyrobitumen is the dominant, sometimes the only, form of organic solid, and therefore the primary reservoir for adsorbed gas. Despite the genetic difference in origin of kerogen and pyrobitumen, there is a tendency to classify all shale organic matter as kerogen in geochemical analyses, due to the lack of petrographic or SEM work which would clarify the situation. Organic material can be classified according to the source of the material, as shown below. 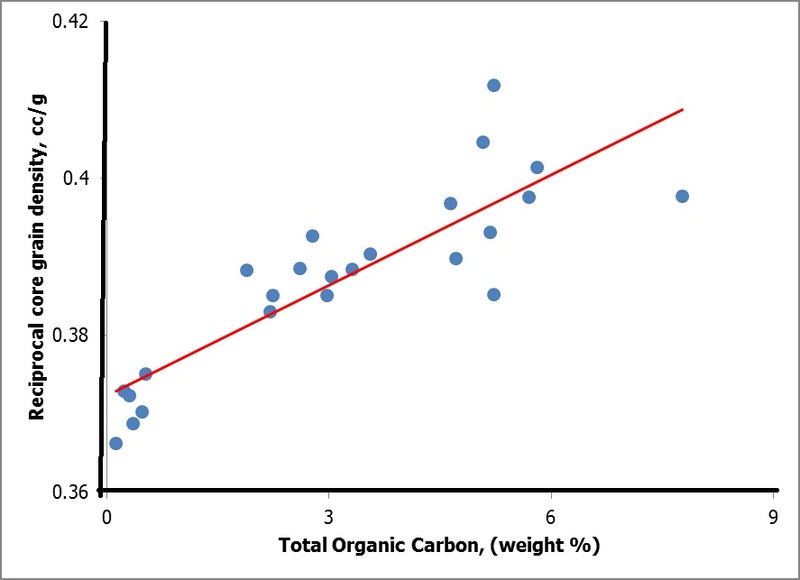 The most commonly utilized scheme for classifying organic matter in sediments is based on the relative abundance of elemental carbon, oxygen, and hydrogen plotted graphically as the H/C and O/C ratio on a so called Van Krevelen diagram. Rather than plot the elemental ratios it is common to plot indices determined by a pyrolysis technique referred to as Rock Eval. In the pyrolysis techniques two indices are determined: the Hydrogen Index (HI) which is milligrams of pyrolyzable hydrocarbons divided by TOC and the Oxygen Index (OI) which is milligrams of pyrolyzable organic carbon dioxide divided by TOC. 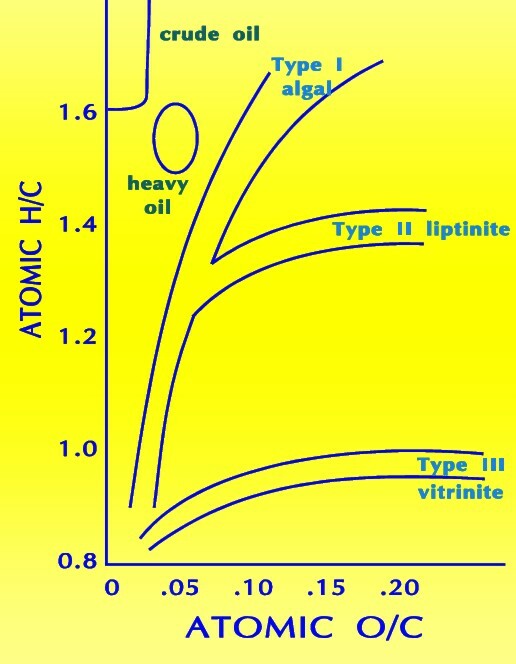 Cross-plots of both elemental H/C and O/C ratios or of HI and OI are utilized to discriminate four ‘fields’ which are referred to as Types I, II, III, and IV kerogen. Type I kerogen is hydrogen rich (atomic H/C of 1.4 to 1.6: HI of > 700) and is derived predominantly from zooplankton, phytoplankton, micro-organisms (mainly bacteria) and lipid rich components of higher plants (H/C ratio 1.7 to 1.9). 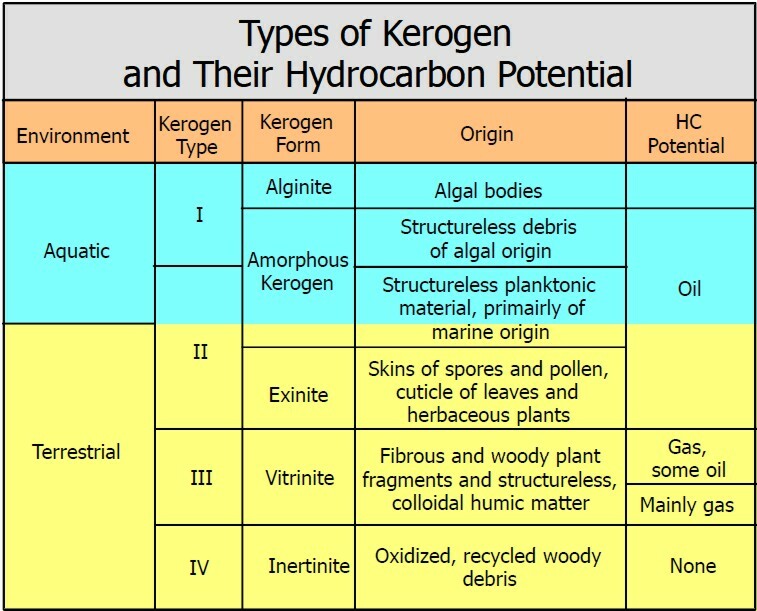 Type II kerogen is intermediate in composition (H/C ≈ 1.2: HI ≈ 600) and derived from mixtures of highly degraded and partly oxidized remnants of higher plants or marine phytoplankton. Type III kerogen is hydrogen poor (H/C ratio 1.3 to 1.5) and oxygen rich and is mainly derived from cellulose and lignin derived from higher plants. Type IV kerogen is hydrogen poor and oxygen rich and essentially inert. This organic matter is mainly derived from charcoal and fungal bodies. Type IV kerogen is not always distinguished but is grouped with Type III. The different types of organic matter are of fundamental importance since the relative abundance of hydrogen, carbon, and oxygen determines what products can be generated from the organic matter upon diagenesis. Since coal is comprised predominantly of Type III kerogen, there is little liquid hydrogen generating capacity. If the coal includes abundant hydrogen rich components (such as spores, pollen, resin, waxes - Type I or II), it will generate some liquid hydrocarbons. Although not common, some oil deposits are thought to be sourced by coals. Note: Portions of the above Section, and the next Section, were taken verbatim (with moderate editing) from CBM Solutions reports. The total organic carbon content of rocks is obtained by heating the rock in a furnace and combusting the organic matter to carbon dioxide. The amount of carbon dioxide liberated is proportional to the amount of carbon liberated in the furnace, which in turn is related to the carbon content of the rock. The carbon dioxide liberated can be measured several different ways. The most common methods use a thermal conductivity detector or infrared spectroscopy. Many source rocks also include inorganic sources of carbon such as carbonates and most notably calcite, dolomite, and siderite. These minerals break down at high temperature, generating carbon dioxide and thus their presence must be corrected in order to determine the organic carbon content. Generally, the amount of carbonate is determined by acid digestion (normally 50% HCl) and the carbon dioxide generated is measured and then subtracted from the total carbon dioxide to obtain the organic fraction. Total organic carbon is often taken to mean the same thing as kerogen, but this is not the case. Kerogen is made up of oxygen, nitrogen, sulphur, and hydrogen, in addition to carbon. The standard pyrolysis lab procedure measures only the carbon, so total organic carbon excludes the other elements. If pyrobitumen, which cannot be removed by solvents, is known or supected, a petrogtaphic or SEM study needs to be done to quantify non-kerpgen organic matter. The kerogen content can then be reduced by an appropriate amount. Another lab procedure, called RockEval, burns both hydrogen and carbon, so the data needs to be calibrated to the standard method by performing a chemical analysis on the kerogen. Typically the organic carbon needs to be reduced by about 10% (the weight of the hydrogen burned) to match the standard method. Rock Eval is the trade name for a set of equipment used in the lab to measure organic content of rocks, as well as other properties of the organics that help to identify the kerogen type. Rock-Eval combusts a crushed sample of rock at 600ºC. Refractory organic matter such as inertinite does not combust readily at 600ºC so most coal samples yield Rock-Eval measured TOC values much lower than actual values because of incomplete combustion. Rock-Eval is not recommended for use with coals or source rocks with significant amounts of Type III and IV kerogen. A rock sample is crushed finely enough so that 85% falls through a 75 mesh screen. Approximately 100 mg of sample is loaded into a stainless steel crucible capped with a micro mesh filter. To ensure accuracy, standard samples are loaded at the beginning and end of the run. Any drift in data can be detected and the samples rerun if necessary. The analyzer consists of a flame ionization detector and two IR detector cells. The free hydrocarbons (S1) are determined from an isothermal heating of the sample at 340 degrees Celsius. These hydrocarbons are measured by the flame ionization detector. The temperature is then increased from 340 to 640 degrees Celsius. Hydrocarbons are then released from the kerogen and measured by the flame ionization detector creating the S2 peak. 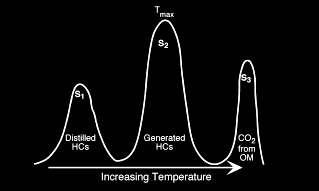 The temperature at which S2 reaches its maximum rate of hydrocarbon generation is referred to as Tmax. The CO2 generated from the oxidation step in the 340 to 580 degrees Celsius is measured by the IR cells and is referred to the S3 peak. S3 = amount of CO2 (mg of CO2/g of rock) - reflects the amount of oxygen in the oxidation step. An alternate method for measuring TOC by solution rather than pyrolysis is described below, from a 1980's TOC report from Australia. "The samples are analyzed for total organic carbon (TOC) according to AS 1038 Part 6. Moisture determinations are made to permit conversion to a dry basis. Carbon occurring as carbonate ion is determined to correct the gross carbon data to give the organic carbon content. This is done by driving off carbonate minerals with HCl acid. The crushed and sieved (100 mesh) samples are weighed and exhaustively extracted in a Soxhlet apparatus using a benzene-methanol mixture. After removal of methanol by azeotropic distillation with benzene, the residue in benzene is diluted with hexane and the hydrocarbon solution separated by filtration from the brown precipitate. The latter is then dissolved in methanol. The yield of methanol soluble material is determined gravimetrically. The hexane soluble portion of the extractable organic matter (E.O.M.) is weighed and chromatographed on silica. Elution with hexane gives predominantly alkanes and subsequent elution with hexane/benzene yields mainly monocyclic and polycycllc aromatic hydrocarbons. The eluted hydrocarbons are weighed, and then analyzed by gas chromatography / mass spectrometry." 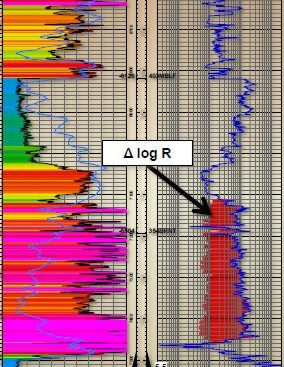 Measured and calculated indices can be plotted versus depth; the resulting log is called a Geochemical Log. 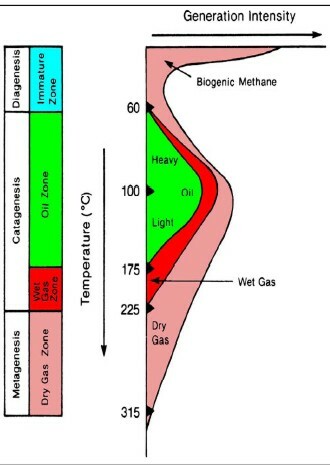 The hydrocarbon potential of organic carbon depends on the thermal history of the rocks containing the kerogen. Both temperature and the time at that temperature determine the outcome. Medium temperatures (< 175 C) produce mostly oil and a little gas. Warmer temperatures produce mostly gas. Vitrinite reflectance (Ro) is used as an indicator of the level of organic maturity (LOM). Ro values between 0.60 and 0.78 usually represent oil prone intervals. Ro > 0.78 usually indicates gas prone. High values can suggest "sweet spots" for completing gas shale wells. Measurement of vitrinite reflectance was described as follows from the 1980's TOC report. "Sample chips or sidewall core samples are cleaned to remove drilling mud or mud cake and then crushed using a mortar and pestle to a grain-size of less than 3 mm. Samples are mounted in cold-setting resin and polished ''as received", so that whole-rock samples rather than concentrates of organic matter are examined. This method is preferred to the use of demineralized concentrates because of the greater ease of identifying first generation vitrinite and, for cuttings samples, of recognizing cavings. The core samples are mounted and sectioned perpendicular to the bedd1ng. Vitrinite reflectance measurements are made using immersion oil of refractive index 1.518 at 546 nm and 23°C and spinel and garnet standards of 0.42%, 0.917% and 1.726% reflectance for calibration. Fluorescence-mode observations are made on all samples and provide supplementary evidence concerning organic matter type, and exinite abundance and maturity. For fluorescence-mode a 3 mm BG-3 excitation filter is used with a TK400 dichroic mirror and a K490 barrier filter." Tmax is also a useful indicator of maturity, higher values being more mature. Graphs of HI vs Ro and HI vs Tmax are used to help refine kerogen type and to assess maturity with respect to the oil and gas "windows". 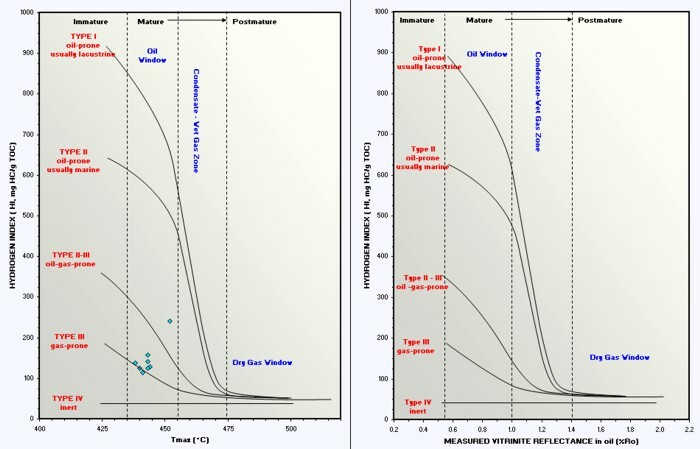 Depth plots of Ro and Tmax are helpful in spotting the top of the oil or gas window in specific wells, and in locating sweet spots for possible production using horizontal wells. Crossplots of HI vs Tmax and HI vs Ro determine organic maturity, kerogen type, and whether the rock is in the oil or gas window. Immature and post mature rocks are not overly interesting as possible source or reservoir rocks. Depth plot of Ro to determine trend line and location of oil and gas windows (Ro > 0.55). Ro is plotted on a logarithmic scale, which makes the trend line relatively straight. 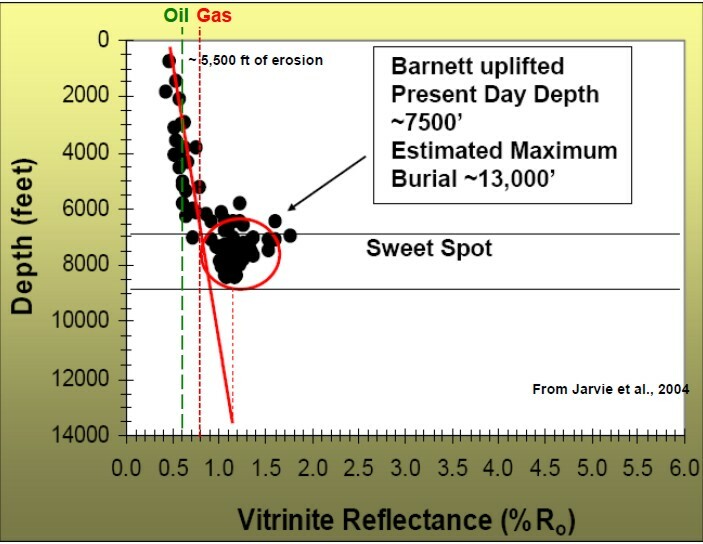 Thermal maturity as indicated by vitrinite reflectance (Ro) versus depth for a Barnett shale, showing "sweet spot" and oil versus gas “windows”. 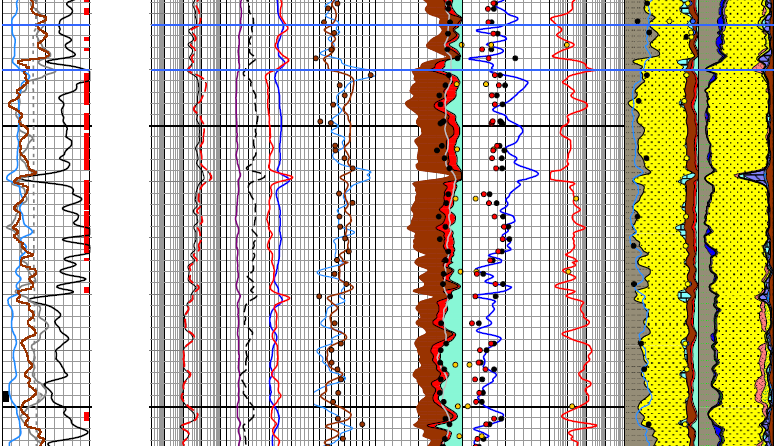 Visual analysis for organic content is based on the porosity - resistivity overlay technique, widely used to locate possible hydrocarbon shows in conventional log analysis. By extending the method to radioactive zones instead of relatively clean zones, organic rich shales (potential source rocks , gas shales, oil shales) can be identified. Usually the sonic log is used as the porosity indicator but the neutron or density log would work as well. The trick here is to align the sonic log on top of the logarithmic scale resistivity log so that the sonic curve lies on top of the resistivity curve in the low resistivity shales. Low resistivity shales are considered to be non-source rocks and are unlikely to be gas shales. Shales or silts with source rock potential will show considerable crossover between the sonic and resistivity curves. The absolute value of the sonic and resistivity in the low resistivity shale are called base-lines, and these base-lines will vary with depth of burial and geologic age. Sonic resistivity overlay showing crossover in Barnett Shale, Texas, labeled "ΔlogR" and shaded red. Crossplots of porosity and logarithm of resistivity can also be used to define and segregate source rocks from non-source rocks. See "Identification of Source Rocks on Wireline Logs by Density-Resistivity and Sonic-Resistivity Crossplots" by B. L. Meyer and M. H. Nederlof, AAPG Bulletin, V. 68, P 121-129, 1984..The best description of the method is posted on the online magazine Search and Discovery, in "Direct Method for Determining Organic Shale Potential from Porosity and Resistivity Logs to Identify Possible Resource Plays* by Thomas Bowman, Article #110128, posted June 14, 2010. 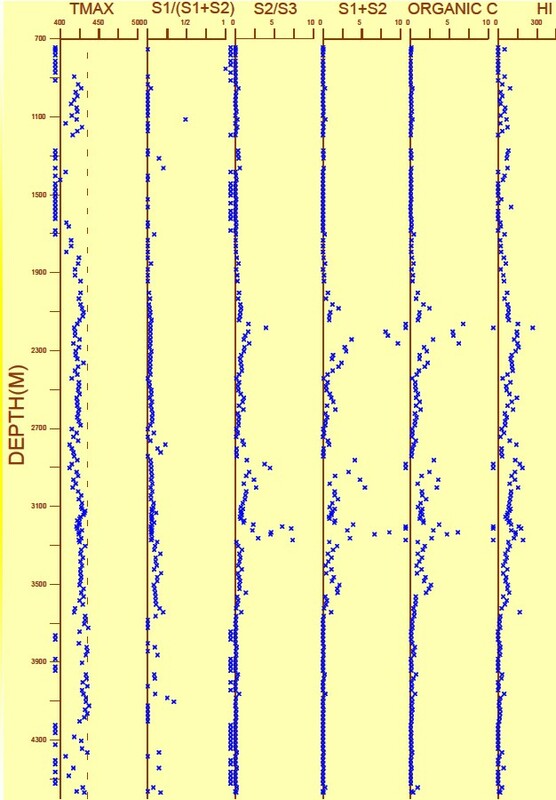 These crossplots usually show a non-source rock trend line on the southwest edge of the data (similar to the water line on a Pickett plot) and a cluster of source rock data to the right of the non-source line, as shown in the image below. The slope and intercept of the non-source line is used to calculate a pseudo-sonic log, DtR, from the resistivity log, which can then be plotted on the same scale as the original sonic log. Sonic versus logarithm of resistivity (DlogR) Crossplot showing non-source rock trendline and source rock cluster of data. The equation of the non-source rock line is DtR = 105 - 25 log(RESD) for this Barnett Shale example. As for the manual overlay technique described above, crossover indicates source rock potential, shale gas, or an oil shale, or if the zone is clean, a potential hydrocarbon pay zone. An example of a DtR log is shown below. Because porosity indicating logs suffer from mineralogy, porosity, and shale effects (not to mention rough and large borehole effects on the density log), as well as the effect of kerogen, Heslop (AAPG 2010) proposed a method of using gamma ray (GR) and deep Resistivity (RESD) overlays instead of porosity - resistivity overlays to find intervals with poential for organic carbon. 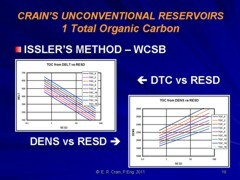 In non-source shale (no TOC,), the GR increases while the RESD decreases, compared to typical reservoir rocks. These two log curves tend to “hour-glass” when plotted using conventional scales. Reversing one of the scales causes the GR and RESD curves to track each other. The exception occurs where TOC is present. When tracking , the separation gap between GR and RESD should be relatively constant. When TOC is present, both GR and RESD will increase in proportion to the TOC, and because of the standard log scales used, the separation gap increases. GRtoc and RRESDtoc were determined using TOC lab data correlated to the GR vs RESD separation gap. Example from Ken Heslop's AAPG 2010 presentation showung GR and RESD in normal scales in Tracks 1 and 2, with reversed ILD on normal GR in track 3. Moderate separation gap between these two curves near bottom marked "TOC". 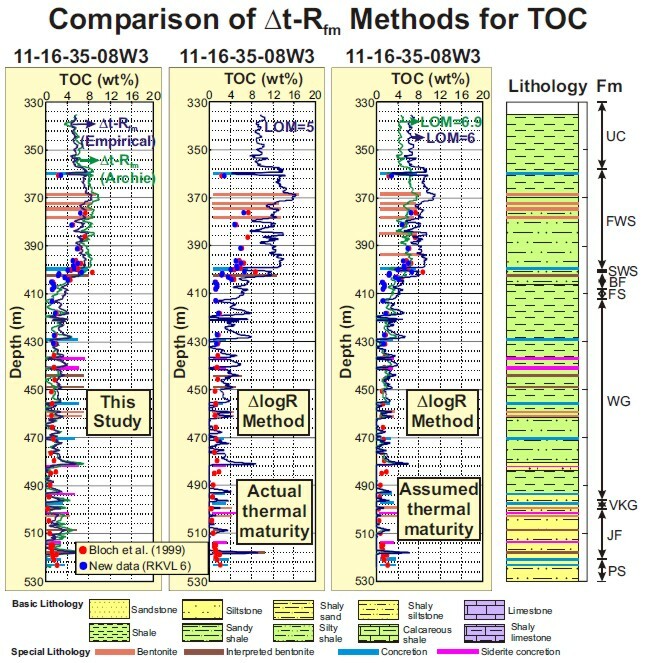 A wide variety of log analysis methods are used to calculate total organic carbon from well logs, ranging from over-simplified to complex multi-mineral probabilistic models. The Passey and Issler models, described later, are in the middle of the pack for complexity. We also need to convert lab data into volumetric terms for comparison to log analyis results. This Section coversd some of these steps. IMPORTANT: Remember that all log analysis models for TOC are calibrated to standard geochemistry lab data that often do not discriminate between kerogen and pyrobitumen. Either or both may be present. Both have variable but fortunately similar physical propertiees so converting log derived TOC to "kerogen" may actually be a conversion to pyrobitumen or a mixture of the two components. Correlation of core TOC values to log data leads to useful relationships for specific reservoirs. 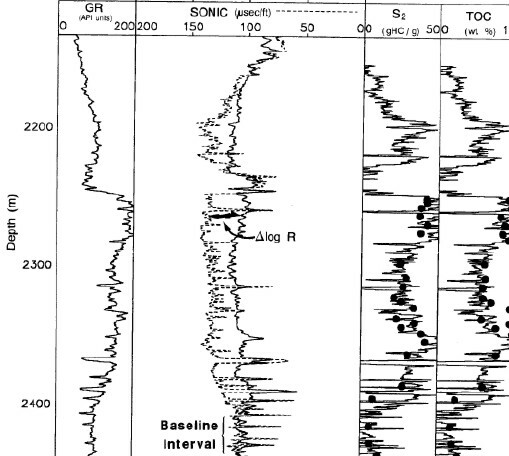 A strong correlation exists in some shales with Uranium content from the spectral gamma ray log. In other cases, the relationship is made with density, resistivity, sonic, gamma ray, or combinations of these curves. Variations in matrix mineralogy strongly affect this type of correlation and it is possible that mineralogy will mask any trend with TOC. 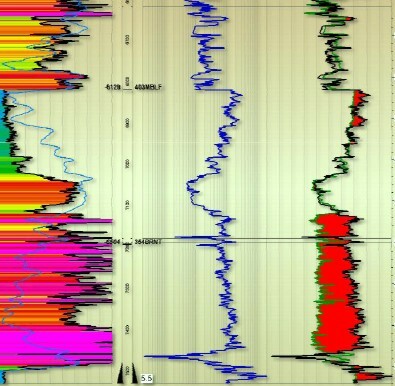 The crossplot shown below is for a particular well in the Barnett shale. Correlation of TOC with density in Barnett Shale: Wtoc = -0.259 * DENS + 0.707. Similar crossplots of sonic or neutron data can be used for specific reservoirs where TOC data is available from core. 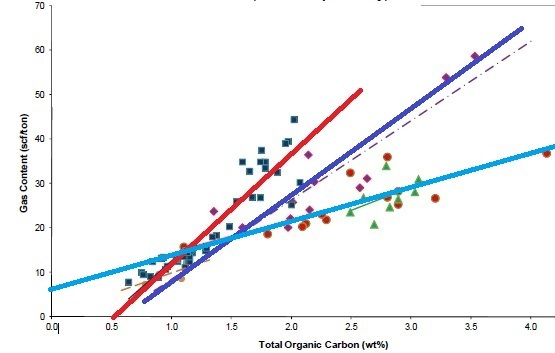 The constants were specific to these shales and may not apply elsewhere.Assumptions are based on an organic matter density of 1.01 g/cc, a matrix density of 2.68 g/cc, and a ratio between weight percent of organic matter and organic carbon of 1.3. The study reported an average organic-carbon content 12.1 wt% (upper shale) and 11.5 wt%(lower shale), using data from more than 250 wells. It may be possible to use crossplots other than TOC versus density (DENS).in local areas. Density may be a poor indicator of TOC due to rough hole conditions or lithology variations (both clay volume and mineral mixture variations can add noise to the crossplot). 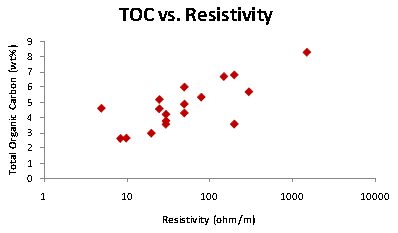 TOC versus DlogR (or DtR), which was derived in a previous section on this page, is really a plot of TOC versus deep resistivity (RESD). Both plots are shown below. Resistivity is not much affected by rough or large borehole or mineralogy variations, but is affected by water fraction in porosity and clay volume. 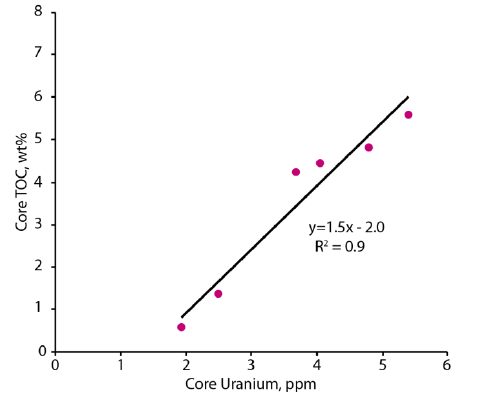 TOC versus uranium (URAN) from a gamma ray spectral log may be useful. Large variations in boreehole size and variations in the uranium content of the kerogen may cause noise. If clay volume is low or nearly constant, the total gamma ray log (GR) may be used. Do not use the "corrected" gamma ray (CGR) as the uranium has been removed from that curve. If both GR and CGR are available without the URAN curve, the difference between GR and CGR is equivalent to the shape of a URAN curve, so a TOC versus (GR - CGR) may be useful. More sophisticated TOC log analysis models, such as Passey and Issler's methods, are developed later in ths weboage. 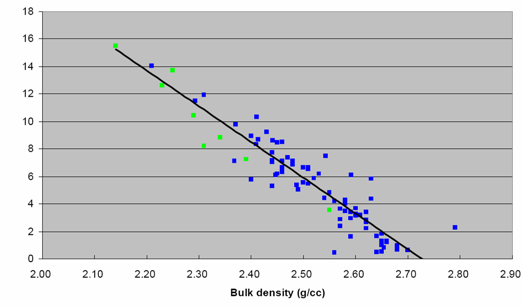 Kerogen density is difficult to measure directly but can be inferred from a plot of (inverse) core grain density versus TOC weight percent or mass fraction. This value is needed to find kerogen volume fraction from kerogen weight fraction. The method also relies on the density versus TOC crossplot. 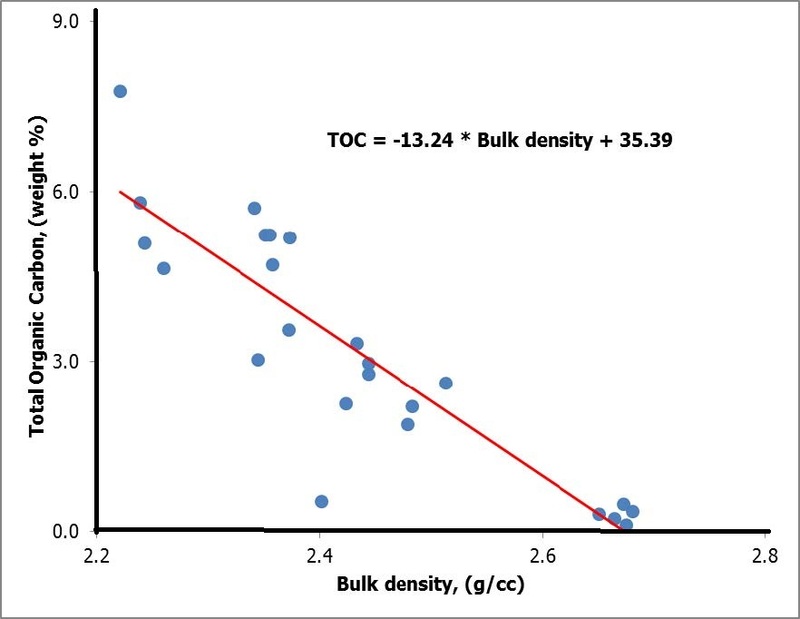 Plot to find TOC specific gravity (DENStoc) and rock grain density (DENSma) using inverse grain density on Y-Axis. Typical values for DENSker are in the range 0.95 for immature to 1.45 for very mature, with a default of 1.26 g/cc. Because of the extrapolation from small TOC values up to 100% TOC, the possible error in DENStoc is quite large, so many people will choose a default based on the maturity of the kerogen. There is a spreadsheet on the Downloads page that does weight to volume and volume to weight conversions -- see example at right. Typically, Vker is a little less than 2 * Wtoc. 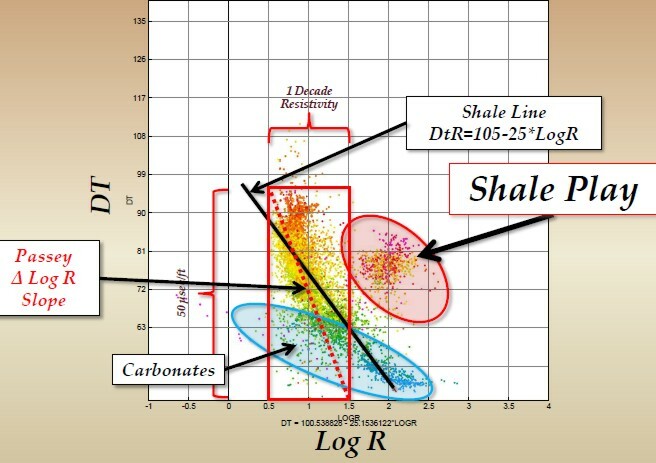 TOC values calculated from log analysis models are widely used as a guide to the quality of gas shales. 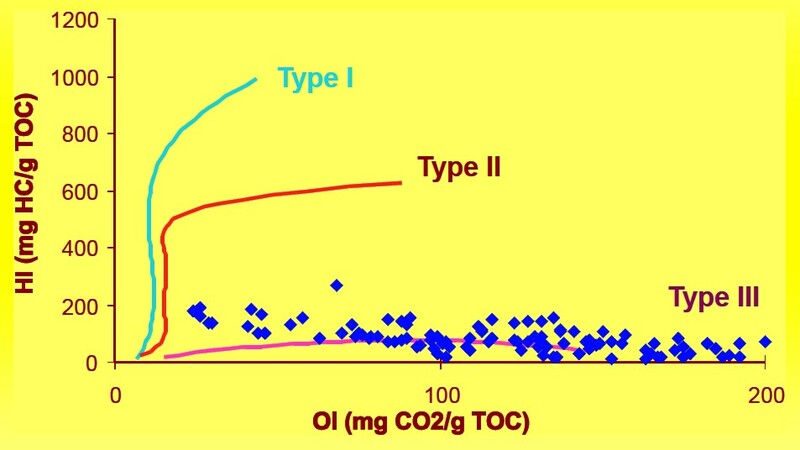 Using correlations of lab measured TOC and gas content (Gc). We can use log analysis derived TOC values to predict Gc, which can then be summed over the interval and converted to adsorbed gas in place. Sample correlations are shown below. Crossplots of TOC versus Gc for Tight Gas / Shale Gas examples. Note the large variation in Gc versus TOC for different rocks, and that the correlations are not always very strong. These data sets are from core samples, cuttings give much worse correlations. The fact that some best fit lines do not pass through the origin suggests systematic errors in measurement or recovery and preservation techniques. Various multi-curve methods for quantifying organic content from well logs have been published, including multiple regression, probabilistic, and neural network solutions. The most common method is based on sonic versus resistivity, as described in "A Practical Model for Organic Richness from Porosity and Resistivity Logs" by Q. R. Passey, S. Creaney, J. B. Kulla, F. J. Moretti and J. D. Stroud, AAPG Bulletin, V. 74, P 1777-1794, 1990. It is also known as the "D log R" method (with or without spaces and hyphens between the characters). The "D" was originally the Greek letter Delta (ΔlogR). Divide metric DTC values by 3.281 to get usec/ft, metric density by 1000 to get gm/cc. In practice, it is rare to have both TOC laboratory measurements and reliable organic maturity data to assist in calibration. Chose a value for LOM that will result in a match with available TOC data. 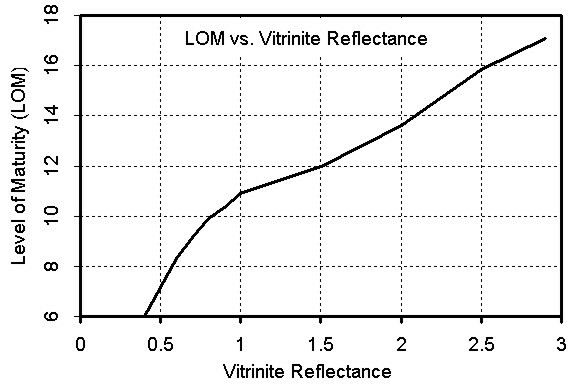 Vitrinite reflectance (Ro) values may be available and are converted to LOM with the graph below. LOM is typically in the range of 6 to 14. Default LOM for a gas shale is 8.5 and fir an oil shale is10.5. Graph for finding Level of Organic Maturity from Vitrinite Reflectance. Higher LOM reduces calculated TOC. Some petrophysicists do not believe this chart, and use regression techniques on measured TOC to estimate LOM - see bottom illustration on this page for an example. 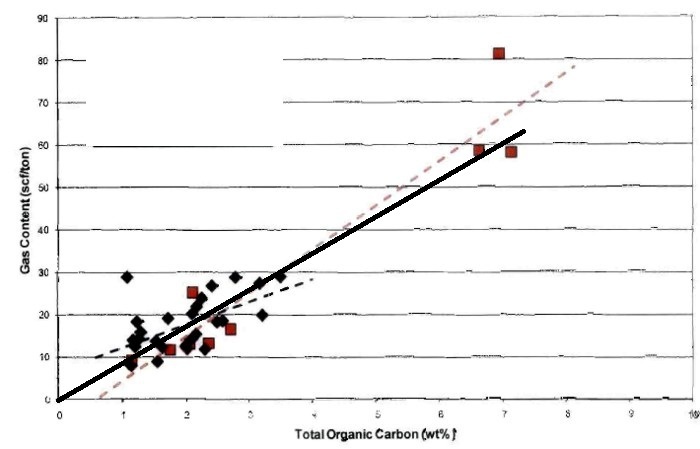 Dale Issler published a model specifically tuned to Western Canada in "Organic Carbon Content Determined from Well Logs: Examples from Cretaceous Sediments of Western Canada" by Dale Issler, Kezhen Hu, John Bloch, and John Katsube, GSC Open File 4362. It is based on density vs resistivity and sonic vs resistivity crossplots (other methods are also described in the above paper). The crossplots were redrafted in Excel , as shown below, and a drop-through code developed to generate TOC, based on the lines on the graphs. No doubt there is a simpler way to code this, but I didn't have time to sort it out. Note that sonic and density data are in Metric units. TOC calculated from DENS vs RESD crossplot gives similar results to the sonic approach, but the density model should not be used in large or rough borehole intervals. Intervals where the sonic log is skipping should be edited before use. The "drop-through" code shown below gives integer values of TOC%, then coverts it to a decimal fraction. Multiple regression equations, developed by Tristan Euzen from the Issler graphs, give smooth (non-integer) values and are of course easier to code into petrophysical software or spreadsheet packages. Thanks for your work Tristan. Log analysis TOC results should be calibrated to lab measured TOC from real rocks. 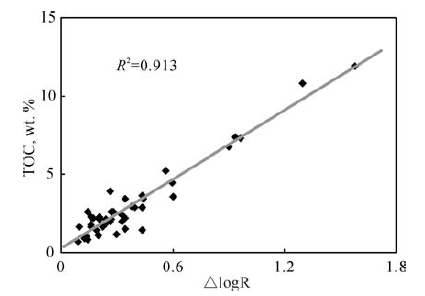 Scale factors SF 2 and SF3 and scale offset SO2 and SO3 are determined by regression of lab versus log derived TOC values. If you want TOC%, remove the "/ 100" from equations 8 and 10. No scale factor or scale offset is needed as the equation is derived from the measured data. Log analysis TOC results should be calibrated to lab measured TOC from real rocks. Scale factors SF 2 and SF3 and scale offset SO2 and SO3 are determined by regression of lab versus log derived TOC values. If you want TOC%, remove the "/ 100" from the final equations. This spreadsheet calculates Total Organic CVarbon (TOC) from the two different models described above. "META/TOC" Total Organic Carbon Spreadsheet. Sample output from "META/TOC" spreadsheet for analysis of Total Organic Carbon from well logs. Calibrate SFuran using lab derived TOC data. Note that the spectral GR could be a core GR log. The ECS log measures the weight contribution of various elements in the formation, for example calcium, oxygen, iron, silicon, and so forth. By using a least squares statistical approach, the elements can be composed into the minerals that might be present in the rocks. One of the minerals can be kerogen. Results are in weight fraction so kerogen can be compared directly to geochemical assays from the lab. The TOC and XRD or XRF lab data can be used to constrain the inversions, giving results that will naturally match kerogen and mineralogy data quite well. An example is shown at the end pf this web page. TOC calculated from Passey DlogR Method. 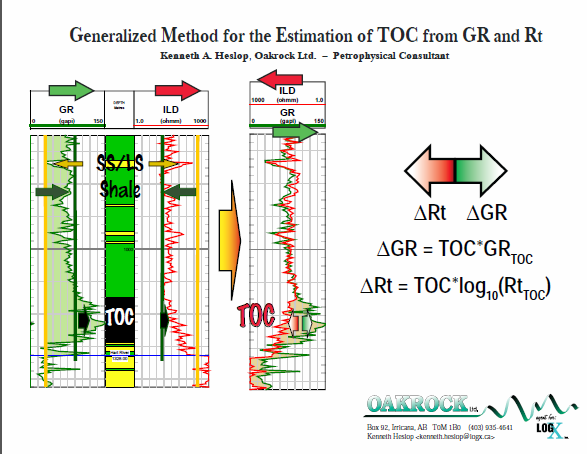 There are numerous published examples with much worse correlations between calculated and measured TOC, usually attributed to varying proportions of Type I, II, and III kerogen or mineral variations (calcite, dolomite, pyrite, and quartz) in the shale. samples using a Rock-Eval 2 instrument; blue dots represent re-analyses of the same samples using a Rock-Eval 6 instrument. For the Issler model, results are presented for both empirical (blue) and Archie (green) resistivity porosity methods. The DlogR method gives poor results for this well when observed thermal maturity is used (LOM = 5.0) An LOM value of 6.9 provides a good fit to the data but it is not representative of the true maturity. A nuclear magnetic effective porosity curves (light grey on porosity track) shows a close match to shale and kerogen corrected density-neutron effective porosity (left edge of red shading). Dark shading on porosity track is kerogen volume. NMR porosity, and corrected effective porosity match very well. The NMR effective porosity is unaffected by kerogen and clay bound water. The far right hand track is the mineralogy from an Elemental Capture Spectroscopy (ECS) log in weight fraction (excludes porosity but includes TOC). TOC from cores, Issler method, and ECS are in the track to the left of the porosity. They also match quite well. The ECS inversion was also calibrated to TOC and XRD data to get a match as good as this. 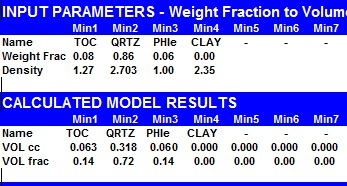 Clay volume in second track from the right is from thorium curve calibrated to XRD total clay, with clay volume from ECS superimposed to show the close agreement. Everything makes sense when you CALIBRATE to lab data but may be NONSENSE if you don't gather the right data.